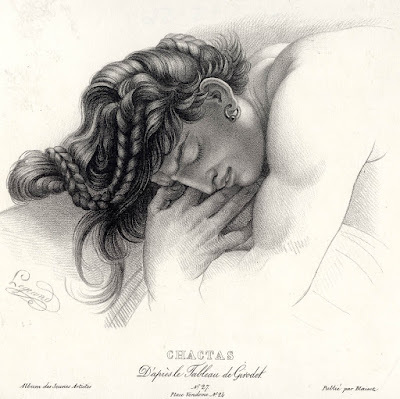 (I do not believe that this is the famous, Louis Auguste Mathieu Legrand [1863–1951], as the printer and publisher of this lithograph were active in the 1820s and were not publishing in the late 1800s). Inscribed in the plate at lower left with the artist’s signature. Condition: crisp impression in very good condition but with signs of use (i.e. there are no tears, holes, abrasions, stains or foxing, but there is light surface soiling). I am selling this small lithograph for the total cost of AU$40 (currently US$30.31/EUR28.24/GBP24.32 at the time of this listing). As the asking price for this print is very low I am selling it with the purchase of any other print. If you are interested in acquiring this delicate lithograph (along with the purchase of any other print as noted above), please contact me (oz_jim@printsandprinciples.com) and I will send you a PayPal invoice to make the payment easy. For those who may be unfamiliar with Anne-Louis Girodet’s painting, “The Entombment of Atala”, upon which this delicate lithograph is based, I must advise that the subject portrayed is not of a beautiful young lady but a beautiful young man who is a character in a Romeo and Juliet type of novel titled, “Atala, ou les amours de deux savages dans le desert” (i.e. 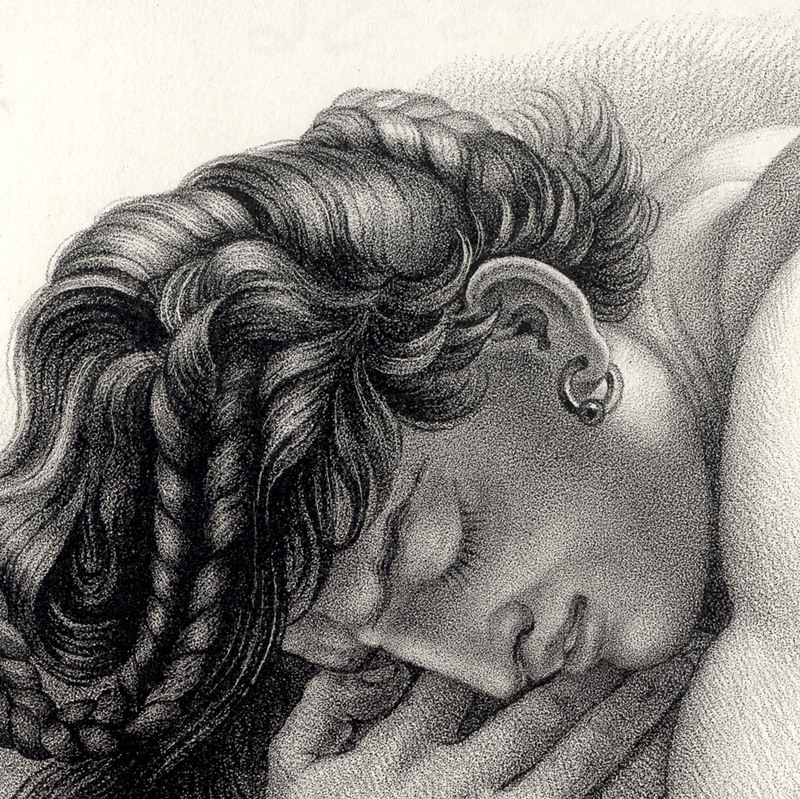 Atala, the loves of two savages in the wilderness) (1801) by François-Auguste-René, vicomte de Chateaubriand. 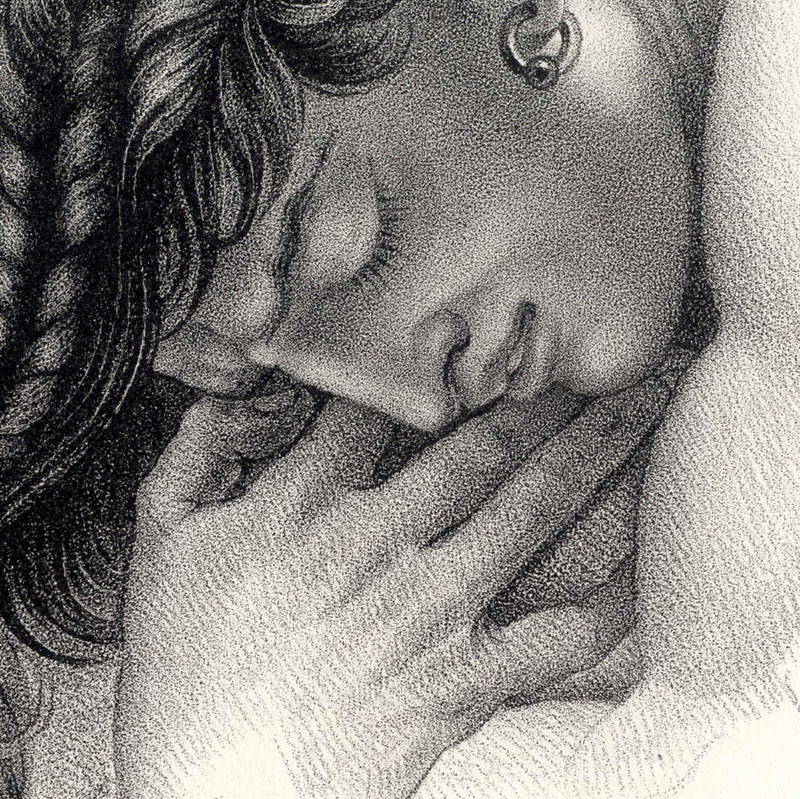 The name of this young man is Chactas—hence the title of the print—and, according to the information on the Louvre website regarding Girodet’s painting, Chactas is shown “stricken with grief” as he clings passionately his dead lover, Atala. (Note: the Louvre website offers an excellent explanation of this painting and François-Auguste-René’s story underpinning it; see http://www.louvre.fr/en/oeuvre-notices/entombment-atala). 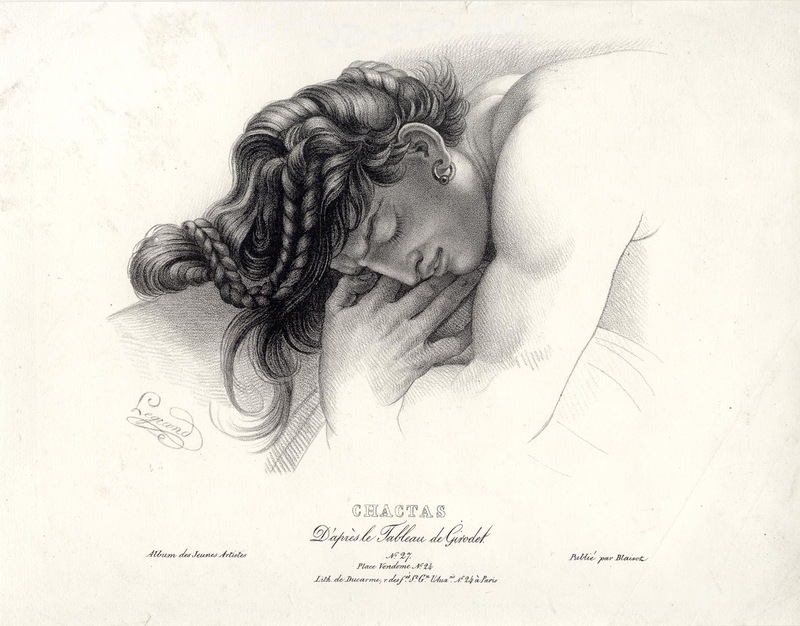 Although the inscription on this lithograph point to Girodet’s painting as the source for the image, I wish to suggest that there may be a strong influence in the modelling of Chactas’ hair from Francisque Duret’s sculpture, “Chactas on the Tomb of Atala” (see https://cestmoi.ca/chactas-sur-la-tombe-datala/). 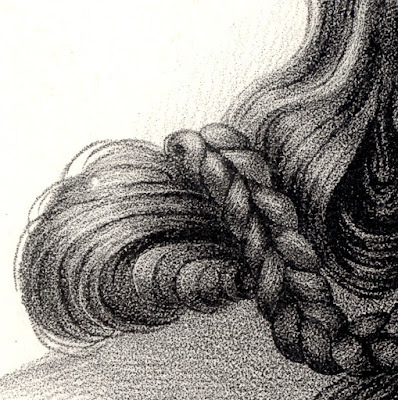 Of course, I may be wrong about this, but the hair style shown in the painting is quite unlike the lithograph and matches very well Duret’s vision of a braided coiffure. Leaving aside the true origin of the portrayed man with a braided coiffure, the topic of who Chacatas stands for in a larger metanarrative is much more interesting. The character, Chacatas is a non-Christian, Natchez Indian who is confronted by the culture of his lover, the Euro-American virgin and Christian girl, Atala, living in nineteenth century Louisiana. Moreover, as the Louvre’s commentary on Girodet’s painting proposes, the story of their relationship “celebrated Catholicism at the time when Bonaparte signed the Concordat with the Church” along with “the exoticism, the defence of the innocence of primitive peoples and the religious sentiment that characterized the novel…” (ibid). In short, there is layering of meanings underlying this seemingly simple study.